Exploring the land and the people of Woodstock Farm in Kempsville, old Princess Anne County from 1833 to today. In 2003 a group from Oaklette United Methodist Church published a book entitled Indian River: From Farmland to Suburbs 1700-1960. They gathered dozens of stories and hundreds of photos from members and neighbors to produce a detailed history of the Oaklette/Norfolk Highlands area. Unfortunately the book is out of print and hard to come by these days, so hopefully a parishioner will see fit to donate a copy to the Virginia Beach Public Library. This photo is originally credited to Marjorie Wolters. Reprinted here by permission of Oaklette UMC. Look carefully and you will see handwriting in the top-right corner that says "Thomson's store 1902". Thomson's Corner, known more recently as Barrett's Corner, is the intersection of Providence and Indian River Roads. The structure at the center of the photo is Thomson's store, which was located on the property now occupied by Family Motors. To the right, Indian River Road extends northwest toward Norfolk Highlands, Oaklette and Berkeley; and to the left, [Old] Providence Road extends southwest toward South Norfolk (though in 1902 Providence Road was referred to as Kempsville Road or "the road from Kempsville to Providence Church."). While the photo is clearly from an age gone by, the 1902 date is in question. Robert Thomson was born in 1881 in Lanarkshire, Scotland, and emigrated to the U.S. in 1904. In 1909 he purchased several acres of land between Indian River and [Old] Providence roads (from the intersection west to the old bank building) and set up shop. It is certainly possible that the photo is from 1902 and "Thomson's store" was a current reference when the photo was labelled and catalogued. It is also possible that the photo was taken at some point between 1909 and 1936. Robert Thomson died in October of 1936. In June of 1946 the land was purchased by Joseph A. Barrett, Sr. The area is still referred to as Barrett's Corner today. This photo is originally credited to Bonnie P. Moore. It is reprinted here by permission of Oaklette UMC. Immediately behind Thomson's store, a little further down Providence Road and about 40 years later, is the G.C. Coleman Farm (now College Park). The barn pictured here survived until recently, having served for many years as the meeting hall of Trinity Tabernacle Church (aka "The Barn"). Today that land hosts the 900 Aquoa apartment complex. This photo is dated ca. 1945; and based on the angles of the buildings in view, I will guess that the photo was taken somewhere near the Dunkin Donuts entrance on Old Providence Road, facing south. Providence Road was re-routed ca. 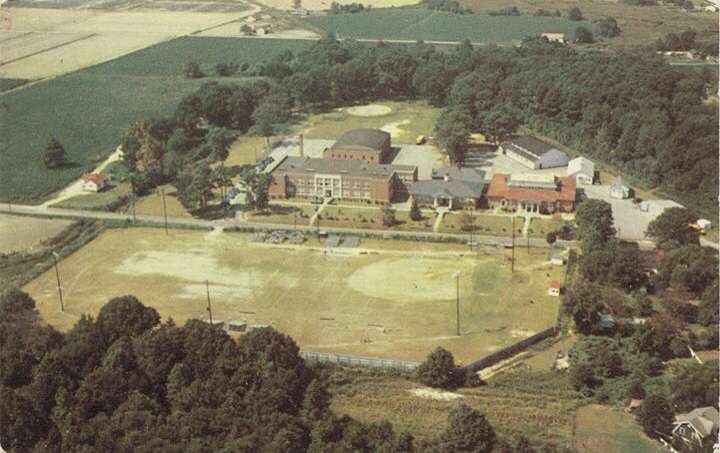 1970 to the other side of the barn as Coleman Farm was developed into the College Park subdivision. A special "thank you" to Frank Nuckols Jr., who let me borrow his copy of the book. While Pheby Richards holds the title of Woodstock's first resident, it was Jesse J. Parkerson who transitioned much of Woodstock from woodland to neighborhood during World War II. From the mid-nineteenth century until 1940, most of the property east of Woodstock Road was just that -- wood stock; 150 acres of timberland . Raymond DeFrees purchased this land from his brother-in-law Emmet Don Sheets in 1929, but lost the property to foreclosure during the economic turmoil of the 1930's . Jesse J. Parkerson, a real-estate investor and president of the Merchants and Planters bank purchased the property out of foreclosure. He parceled it up into 4 and 8 acre lots which were then sold off over the next 8 years . Princess Anne County Map Book 12 page 45. 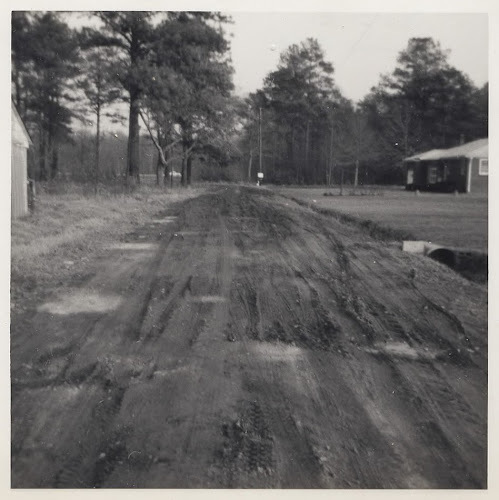 At this time, Woodstock Road is known simply as "Public Road" and Walker Road is "Private Road". Parkerson called upon Burt Hunter, a tenant farmer who had been living in Woodstock for nearly 10 years, to meet with potential buyers and show property boundaries. In trade for his services, Mr. Parkerson conveyed a 1 acre plot of land at the corner of Woodstock and Walker Road to Burt and his wife Della. 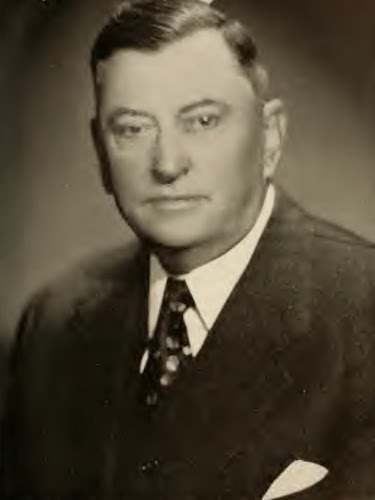 JESSE J. PARKERSON—Since 1929, Jesse J. Parkerson has been president of the Merchants and Planters Bank of Norfolk, and his experience in his profession dates from the early years of the century. He joined the staff of the bank in 1902 and has played a conspicuous part in its growth. Not only as a banker but as a progressive citizen and promoter of civic causes, he has proved his value to the area. Born July 23, 1884, in Berkley, Virginia, now a part of the city of Norfolk, he is a son of the late W. T. J. and Cherry (Martin) Parkerson. After attending public and private schools and a business college, he began his career in Berkley as a runner for the Merchants and Planters Bank on January 2, 1902. Advancing through the positions of bookkeeper and teller, he was made cashier on December 31, 1909, and was elected president on January 16, 1929. The Merchants and Planters Bank was the first financial institution to be established in that part of the city which lies across the eastern branch of the Elizabeth River. It opened its doors April 1, 1900. Founded through the efforts of Alvah H. Martin, Sr., and other progressive citizens, it began its existence with a capital of thirty thousand dollars. Foster Black was its first president, and he was succeeded by Alvah H. Martin, who saw the bank's capital increased to fifty thousand dollars. Following the death of Mr. Martin on July 5, 1918, Colonel S. L. Slover became its executive head. During his tenure of office, two branches were opened: the Campostella Branch, at Campostella Road and Springfield Avenue in 1924, and the South Norfolk Branch, Twenty-second and Liberty Avenue, in 1927. Active in other business connections as well, Mr. Parkerson is treasurer and a director of the Chesapeake Building Association, and a director of the Security Insurance Agency, Inc. He is president and director of the South Norfolk Bridge Commission, a director of the Norfolk Chamber of Commerce, and a member of the Virginia State Chamber of Commerce, and as a bank executive, belongs to the Virginia Bankers Association and the American Bankers Association. In his own city he is a member of the Norfolk Executives Club, the Norfolk Yacht and Country Club, and Doric Lodge No. 44, Ancient Free and Accepted Masons. In Masonry he is a member of the higher bodies including the Ionic Chapter of Royal Arch Masons. In civic and philanthropic fields, he serves on the board of directors of the Central Young Men's Christian Association, as treasurer of the Norfolk area of the Virginia Society for Crippled Children, as a member of the lay board of the DePaul Hospital, and of the Pension Bureau of the city of Norfolk. He has been active in the Norfolk Community Chest fund campaigns; and during the World War II period, did outstanding work for the Norfolk War Finance Committee on behalf of the United States Treasury Department. A communicant of the Memorial Methodist Church of Berkley, he formerly served on its board of stewards and as treasurer. 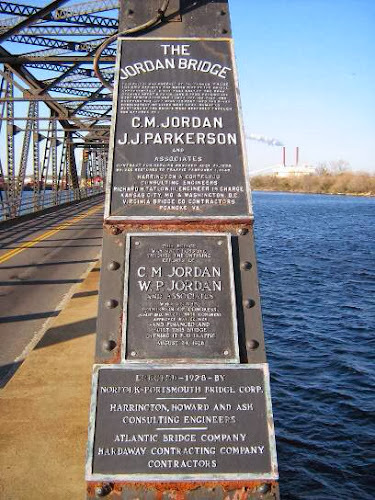 Jesse J. Parkerson died November 21, 1959, at the age of 75. Woodstock's development can be broken down into 3 regions: north Woodstock, bordered by Walker Road, I-64 and the river was the first plot of Woodstock proper to have a residence. West Woodstock was not part of Edward Herbert's Woodstock, but was grafted in over time. East Woodstock, spoken of here, originally included the land between Woodstock Road and present day Rodney Lane, if Rodney Lane were extended from Providence Road to the river. The DeFrees family would keep their primary residence through the 1950's -- a dairy farm located at the historic Francis Land house on present-day Virginia Beach Blvd. Lot 17 was the exception, weighing in at about 43 acres. Frederick L. Hood purchased this land from Mr. Parkerson in May, 1942. 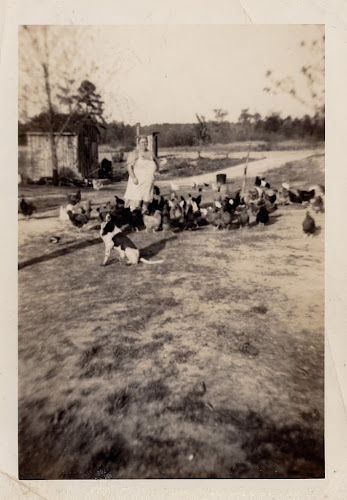 The land was later purchased by Silas Harrison, brother of Walter Harrison (who lived on what is now the Woodstock Cove subdivision from 1934-1951). Silas' widow Mildred Harrison sold the land to developers in the mid-1960's, and it is now part of the Avalon Terrace subdivision. Deed records form the backbone for much of the research found in these posts. But there is so much that a deed does not say: were these people good neighbors, well liked in the community? Were the grantors friends of the grantees, or family; or did the transaction take place between anonymous persons who never met? I really enjoy finding connections that extend beyond mere real-estate transactions. I was gratified to learn that the Olivers, Harrisons and Steeles were not merely neighbors, but family . I received similar good news when I met recently with sisters Debbie Yancey and Ruth Barrett to look through their old photo albums. Debbie and Ruth are daughters of Perry and Helen Kight and former Walker Road residents. Debbie contacted me after reading this blog to let me know that Burt and Della Hunter were her grandparents. 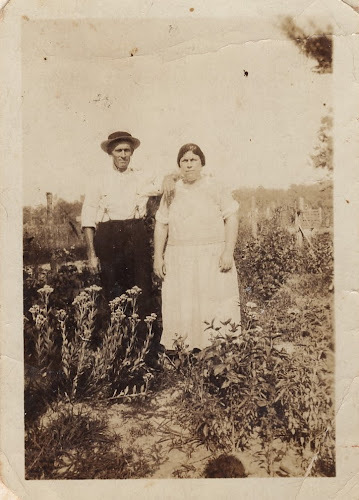 My first introduction to Burt and Della, beyond the 1941 deed for their property on the south side of Walker Road, was from my interview with Mary Anne Harrison Smith. 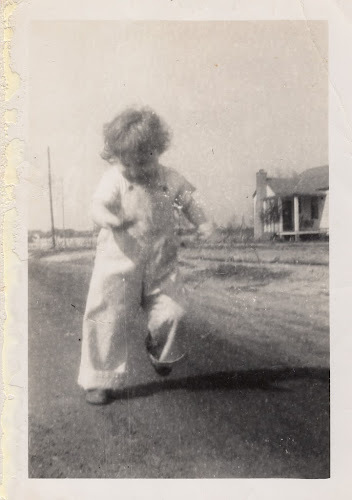 Della was the neighborhood gossip who kept Mary Oliver from her chores; Burt was the Jack-Sprat-ly fellow who was falsely accused of leaving Della's undergarments on the clothes line (they had actually been pranked by the Harrison children). Thanks to Debbie and Ruth, I learned much more about Burt and Della; and they passed along some photos of Woodstock from the 1930's to the 1970's that I am pleased to share with you now. 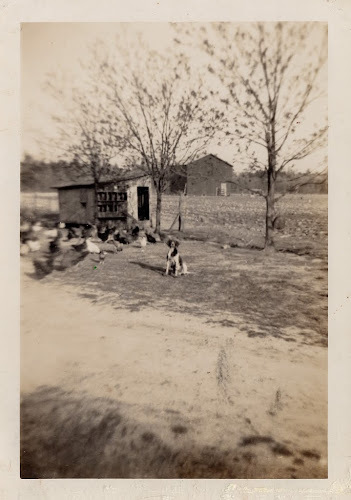 In the 1930's Burt and Della Hunter were tenant farmers on the Perdue (later Walker) farm along what is now Sterling Road. 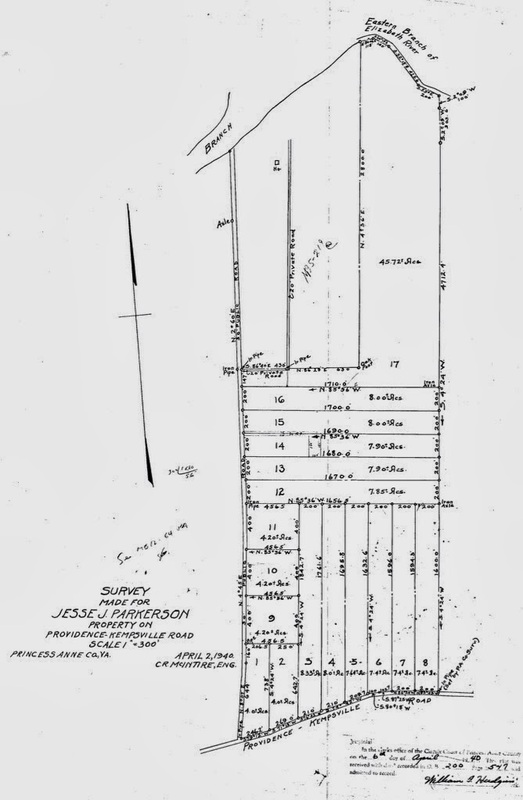 When Jesse Parkerson purchased the 150 acres of woodland along the east side of Woodstock Road in 1940, he enlisted Burt Hunter to show the 4 and 8 acre parcels to potential buyers; identifying plots and pointing out property boundaries. 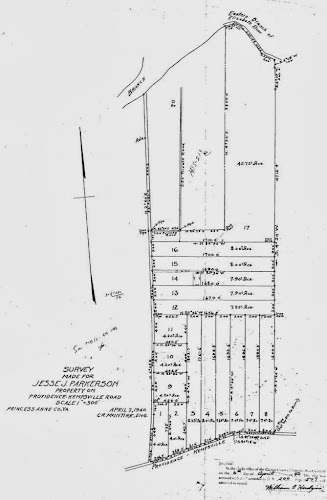 In exchange for his services, Mr. Parkerson conveyed a 1 acre plot along the south side of Walker Road to Burt. As a result, Burt and Della became the first homeowners on the east side of Woodstock Road. This house, located in what is now the front yard of 501 Sterling Road, was first made known to me as the Perdue home from the 1920's. Burt and Della occupied this home as tenants of the "Walker house" (as it came to be known) in the 1930's. That's Burt and Della's daughter, Helen Kight. That's the river on the other side of the house. Della, tending chickens on the Walker farm, pre-1941. 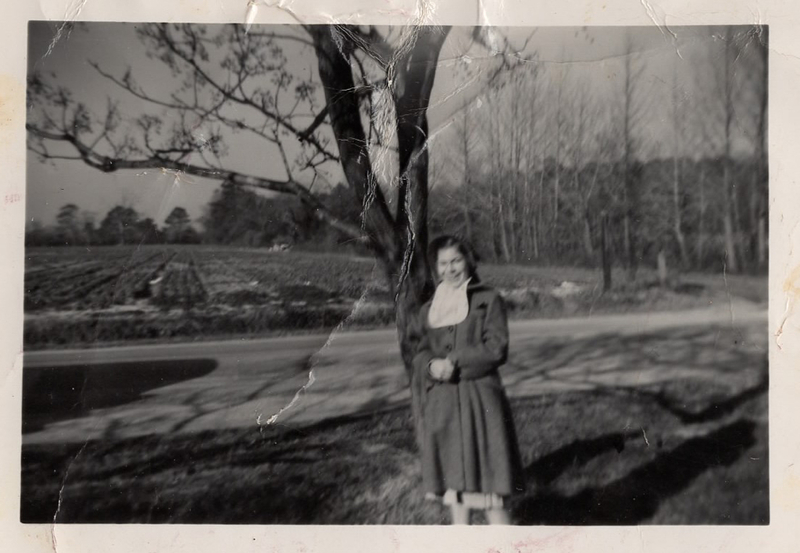 She is probably standing about where 512 Sterling Road is now, and we are looking southwest, toward where Sterling Court is today. That barn is behind what is now 524 Sterling Road, in the east-bound lane of I-64. Burt and Della were the last tenants to farm the land along Sterling Road. Subsequent owners kept cows and horses until the mid-1960's. 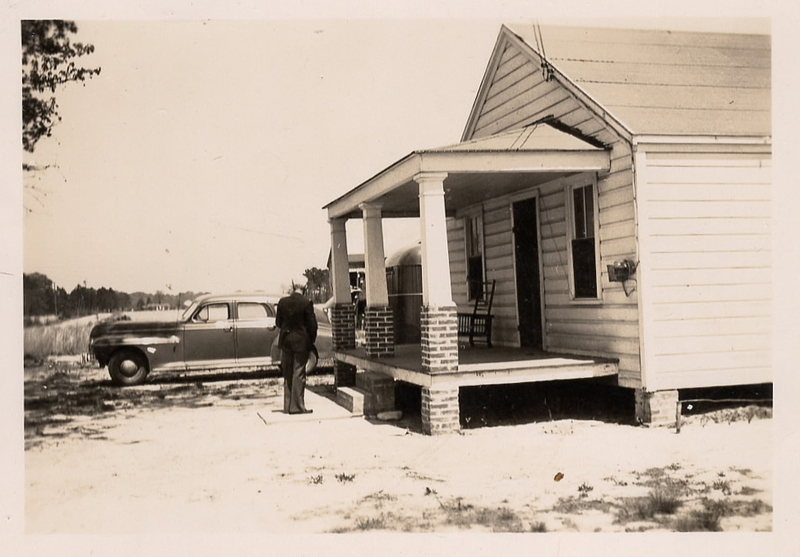 The Hunters' new home after 1941, at the corner of Woodstock and Walker Roads. The house was of modest rural construction, with some of the roof joists still covered in tree bark. Bathroom facilities were outside. The house was torn down in the mid-1970's, and today that plot of ground is 5881 Walker Road. I date this photo prior to 1945 because the Jimmy Steele house (now 568 Woodstock Road) doesn't appear to have been built yet. It should be on the other side of the car. The farm beyond is the Oliver farm at this time, or the 500 block of Woodstock Road today. 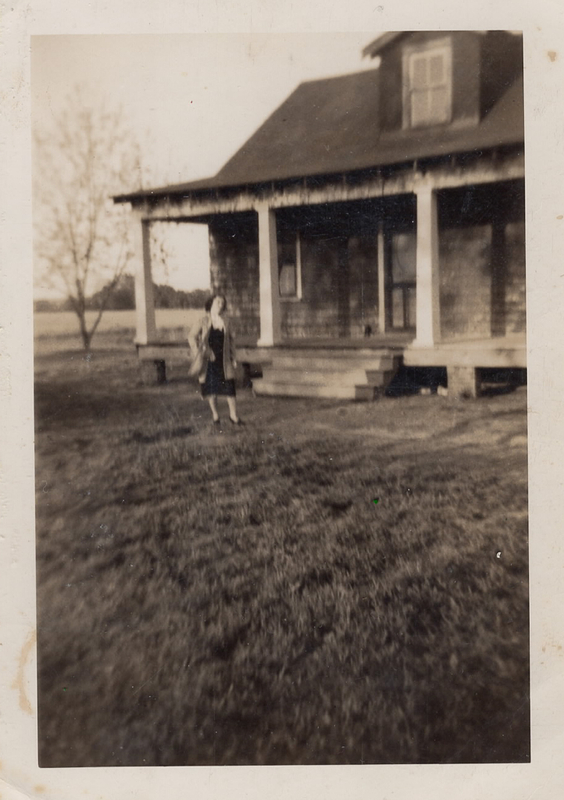 This is Helen "Snookie" Kight (elder sister of Debbie and Ruth, daughter of Perry and Helen Kight). If we take a guess at her age (I'll say 3?) then this picture is ca. 1946. That is the Jimmy Steele house to the right, and the former Oliver farm beyond. The Olivers (in their late-60's by this time) sold their farm the year before and bought Jimmy Steele's house. Snookie again, with Woodstock Road behind her and the former Hastings farm on the other side of the road (E.V. Williams Construction owned it at the time this picture was taken; ca. 1958). During the E.V. Williams years, this property was used as a borrow pit and a trash dump. Today the land in view here is 613 Woodstock Road, Woodstock Cove Park, and a lake. Walker Road, ca. 1970. Note the vehicle travelling on I-64 in the distance. The Kight house is on the right, occupying the eastern half of the Hunter property. The Kight house was demolished in 2011 and 4 brand new homes occupy that land today. 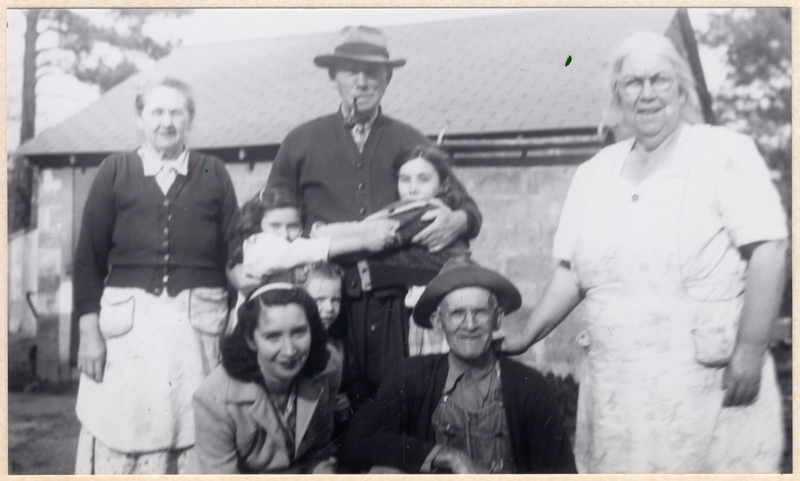 Neighbors: Mary and John Oliver, with John surrounded by his grandchildren, Mary Craddock (on his left) Joan Craddock (on his right) and an unidentified little one in front of him; The Olivers' daughter Elsie Craddock is front row left, with Burt and Della Hunter on the right. That structure in the background is the garage for the Jimmy Steele house, which still faces Walker road today. ENDNOTES: I may be making references that newer readers are not familiar with. For a good overview of Woodstock's history, including notable names and dates, see my PowerPoint presentation. Today I found the Sargeant Memorial Room at the Norfolk Public Library. If you read any books on local history, there is a very good chance that several of the photos will have "Courtesy of the Sargeant Memorial Collection" noted somewhere nearby. I asked about their Princess Anne County photo collection, and the guy at the desk pulled four file folders out of a drawer and handed them to me! I spent the next 30 minutes or so sifting through old photos. One set of photos caught my eye immediately, because they answered a nagging question that has occupied my mind since my interview with Mary Ann Harrison Smith. 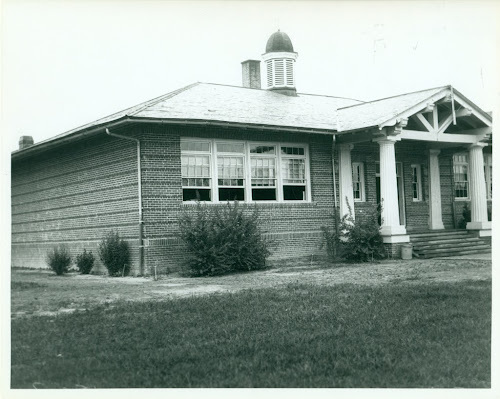 She said she attended Kempsville Elementary during her grammar school years (1942-) and that the building had "real pretty white columns in front". I attended Kempsville Elementary in 1978 & 1979, and there were no "real pretty white columns!" 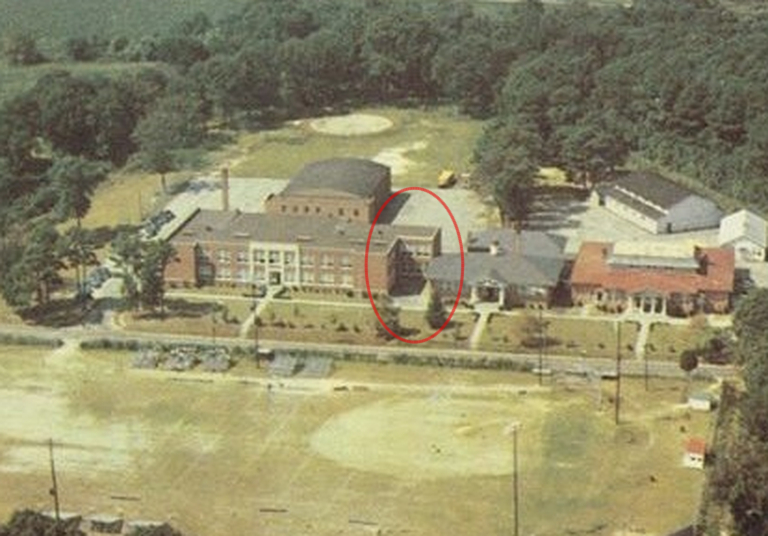 I also knew that my Kempsville Elementary only dated back to the 1960's, so she couldn't be referring to that building. I knew Kemps Landing School was older, but Kemps Landing doesn't have real pretty white columns either. 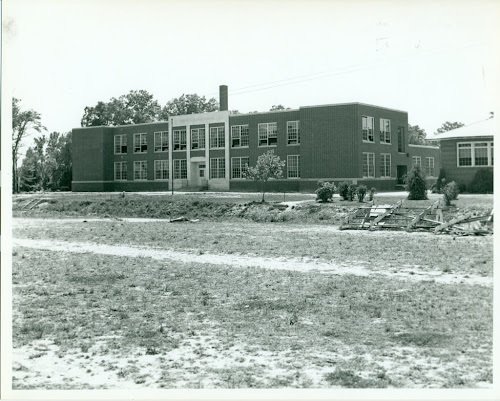 The Virginia Beach Public Schools website has a short history of the old Kempsville Elementary and it seems to indicate that the building that eventually came to be known as Kemps Landing, built in 1941, was the original Kempsville Elementary. But what about the pretty white columns? Mary Ann did say that her old school was torn down; so did they tear down a previous school with white columns when they built Kemps Landing? But if that is the case, it would have been torn down before Mary Ann was old enough to attend. 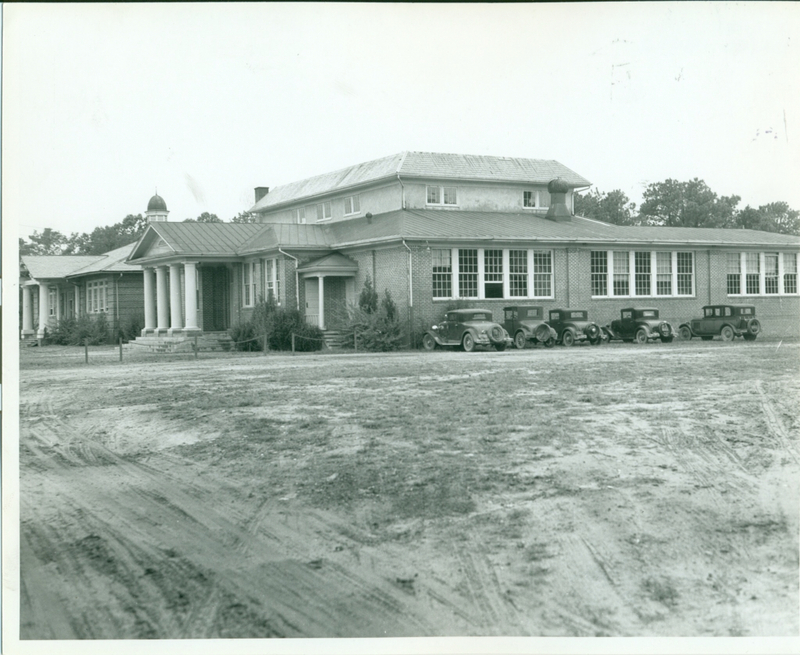 There is an inscription on the back of this photo, "Kempsville Grammar and High School; 10-7-31". YES! There are COLUMNS! In fact, there are two buildings here, side by side, and they both have columns. Which one is the grammar school? Which one is the high school? The photo doesn't specify. Here is the building we are all familiar with, because it still exists today. The photo is inscribed, "Kempsville High School; 5-14-42". My generation knows it as Kemps Landing (not the magnet school; before the magnet school); but whatever you call it, there it is. Now, please note the building to the right of the new high school: see the windows? It looks like they did not tear down the old schools when they built the new one. 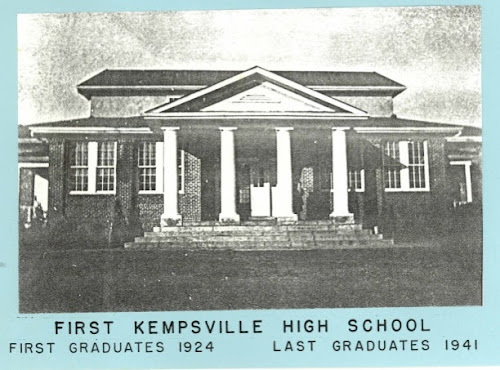 It is a postcard of Kempsville High School, but there is no date. I was always under the impression that the two buildings to the right were the old jail and a municipal building -- but it is crystal clear now that all three buildings are school buildings. The two buildings on the right are the buildings in the photographs above. Now we know which building was the grammar school and which was the high school! The last graduating class was in 1941, and the doors opened at the new high school later that year. For the record, the grammar school is the oldest building here, constructed in 1910. Both the grammar school and the old high school would be demolished prior to 1953 to make room for a one-story addition to the new building. That addition survived until very recently, when it was torn down to accommodate the re-routing of Princess Anne Road. The wall that faces the grammar school is the northernmost edge of the building in this 1942 photo. By the time this picture was taken (before 1953) a new wing has appeared on the northwest corner of the building. That addition is still there. If you've watched my Woodstock History PowerPoint presentation, then you are already familiar with Pheby and Elisha Richards. Pheby's name is on the 1878 deed for Woodstock Farm, so the Richards are probably the first family to call Woodstock home. 1878-79 was a time of great transition for the Richards family, which may explain why Pheby ended up selling the farm just a few years later. Despite their abbreviated tenure, Elisha and Pheby are part of the Woodstock story -- a story that recently became a little more personal. During a routine Googling session I found Pheby and Elisha Richards names on U.S. Treasury Department payroll documents from 1877 and 1879. They were listed as keepers of the Craney Island Light at the entrance to the Elizabeth River. I was astonished that someone at Google took the time to digitize the U.S. Treasury Department payrolls for 1877 and 1879, and make them available online! Those particular documents seem almost random in terms of historical significance, but they provided a fascinating historical connection between Woodstock and the larger Hampton Roads history.I started an e-mail campaign to locate any documentation that might be available for the Craney Island Light. Several Virginia and North Carolina lighthouses have survived to this day; but unfortunately, Craney Island is not one of them. Probably for this reason much of the documentation from that period has been lost to history, save one item: a hand-written letter from Pheby Richards to the Secretary of the Navy. As lightkeepers at Craney Island from 1873-1879, Elisha and Pheby would have maintained a residence there. Lighthouse appointments were generally restricted to persons between the ages of 18 and 50; but by 1878, Elisha and Pheby were both well into their 50's, with Elisha 4 years her senior (this might also explain why she mentions her son-in-law's age). They may have been looking forward to their next stage in life when they purchased farm land in Princess Anne county; however, plans changed in July, 1879 when Elisha died suddenly of a probable stroke. As if to compound the tragedy of the sudden loss of her husband, Pheby's request to keep her position at the lighthouse would arrive just a few days too late. Written on July 22nd, it was received by the lighthouse board on July 26th; on July 23rd, the board nominated Robert B. More as acting lightkeeper at Craney Island, with Marshall Sand taking over as acting assistant keeper a few months later. Pheby sold Woodstock Farm in 1882, at a 10% loss. She lived with her daughter Fannie and son-in-law James W. Bacchus in Norfolk for many years after, and by 1910 (just before her death) she was living in Portsmouth with another daughter Ella and son-in-law William Wilder (the one mentioned in the letter). In the years that followed, The Craney Island Light fell victim to severe structural decline. In 1884 the 25 year old square structure was replaced with an entirely new octagonal structure. This second lighthouse is the one usually represented in pictures of the Craney Island Light. That structure was replaced in 1936 by an automated beacon. Today, only a signal bouy marks the spot once occupied by the Craney Island Light. R.B. More is listed as the keeper of the Cape Charles lighthouse in the same 1877 payroll document, but he is not on the 1879 payroll, probably because he retired by this time. An Infantry Captain in the Civil War, More was 65 years old when he (temporarily) took over duties at Craney Island. 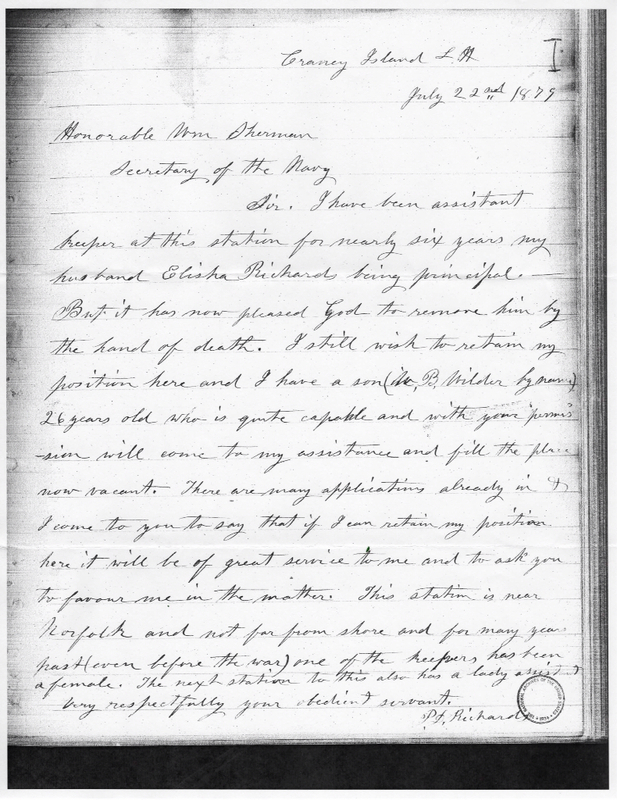 The "next station" that Mrs. Richards refers to in her letter is probably the Lambert's Point lighthouse, staffed by William L. Clegg and Mrs. J. V. Clegg. There is some incongruity in Mrs. Richards addressing a "Wm Sherman" as Secretary of the Navy. Richard W. Thompson was Secretary of the Navy from 1877-1880. However, the national network of lighthouses was under the oversight of the Department of the Treasury, not the Navy. John Sherman was Treasury Secretary from 1877-1881. John's brother was William Tecumseh Sherman, the famous Union general during the Civil War. 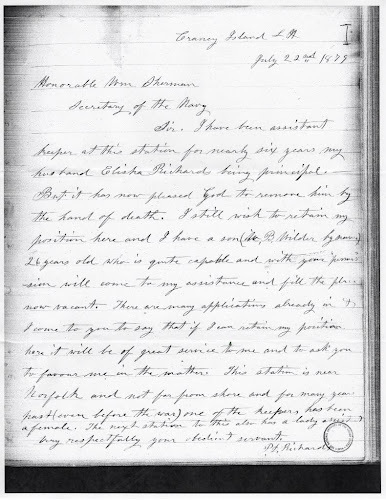 This research thread has led to one correction in the PowerPoint presentation: a couple of family record references state that Elisha Richards died in 1878. However, the U.S. Treasury Department records indicate that he remained on the payroll at least through the end of 1878, and he is on the 1879 roster. It seems unlikely that the lighthouse board would wait an entire year to fill the vacancy, and it also seems unlikely that Pheby would wait a year to defend her position to the lighthouse board. 1879 seems like the more likely year of Elisha Richard's death. If Woodstock Road isn't the oldest residential street in Kempsville, it certainly rates in the oldest 1% of residential streets in Kempsville; and possibly in all of Virginia Beach. I am making a distinction here between residential streets (roads that serve specific neighborhoods; Lord Dunmore Drive, Edwin Drive, Indian Lakes Blvd., etc.) and main roads (roads that interconnect municipalities like Norfolk, Kempsville or Great Bridge and are generally lined with businesses; Kempsville Road, Princess Anne Road, Indian River Road, etc.). I will grant that in Princess Anne County's rural years, farms lined the main roads; and even today Kempsville Road is lined with houses. But with the proliferation of suburban residential development beginning after World War II, and really gaining steam in the 1970's, Woodstock's 19th century origins set it apart from other Kempsville neighborhoods like Fairfield, Larkspur and Indian Lakes. Plat of Woodstock, 1877. Note the road along the eastern border. This is not the present day Woodstock Road; in fact, this road no longer exists. The present day Woodstock Road is not depicted on this plat, which means it was probably constructed after 1877. The first mention of the right-of-way that we now refer to as Woodstock Road occurs in the deed of sale between Samuel Kimberly and Pheby Richards in 1878. Mrs. Richards purchased a 65 acre riverfront plot from Kimberly; from present-day Walker Road north to the river, and from I-64 west to the creek. 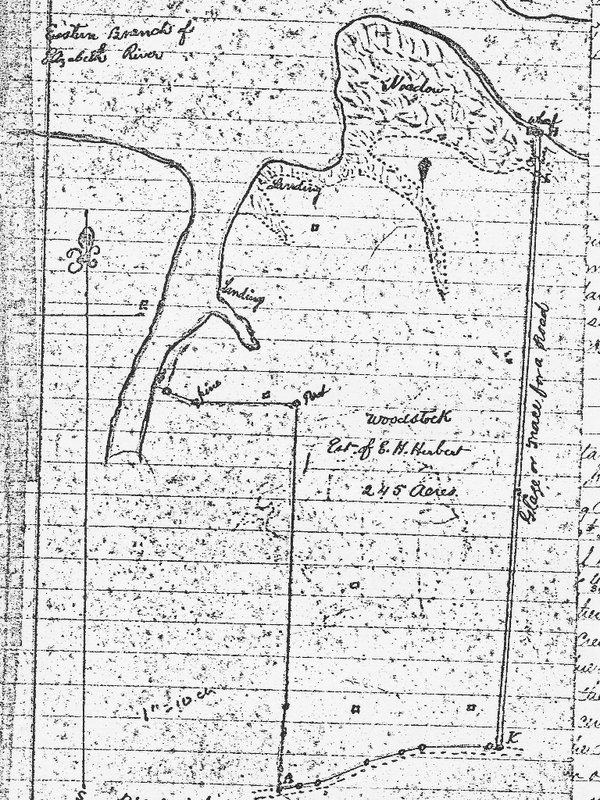 Her land was separated from the main road (Providence Road) by the rest of Kimberly's land to the southeast and the Whitehurst farm to the southwest. The construction of a new road between these two properties would be necessary to allow Mrs. Richards access to her purchase. The deed of sale grants "the said Kimberly ... the right of use of the road or lane running through the land of said Pheby D. Richards to the creek or river, and the said Samuel Kimberly agrees that the said P. D. Richards shall have the right of way to the main road 40 feet wide." (Princess Anne County deed book 54 page 227). A survey plat of Woodstock from 1877 does show a lane from the river to the main road, but it runs along the eastern border of Woodstock, not through Pheby Richards land; and so therefore cannot be the road spoken of here. In fact, Woodstock Road began in 1878 as Pheby Richard's driveway. 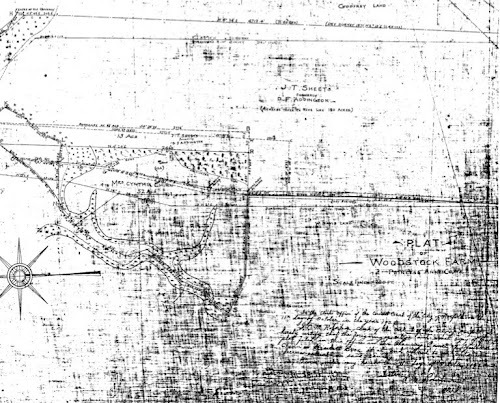 Plat of Woodstock Farm, 1914. This map runs north/south along the horizontal axis. Note how the road bends to the east shortly after entering the Chinn property. Our next exhibit is a survey plat of Woodstock Farm from 1914 (Princess Anne County map book 8, page 76). The former Richards property is now under the ownership of young Cynthia Chinn, who has taken her neighbor to court for logging on her land. 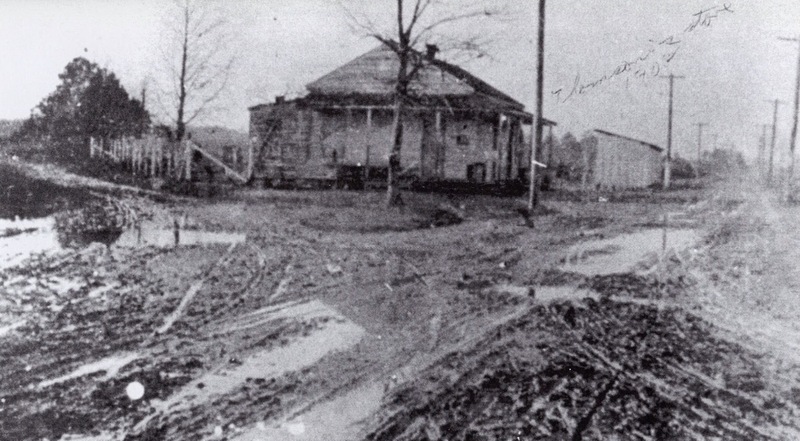 The 1914 plat which was entered as evidence in Cynthia Chinn v. Gimbert Brothers et. al., is both remarkably detailed and poorly preserved; but for our purposes it is legible where it needs to be. The plat shows the road that connects Woodstock Farm to the main road; but it is interesting to note that the road takes a noticeable eastward bend once it enters the farm, reaching the river closer to where Sterling Road does today. 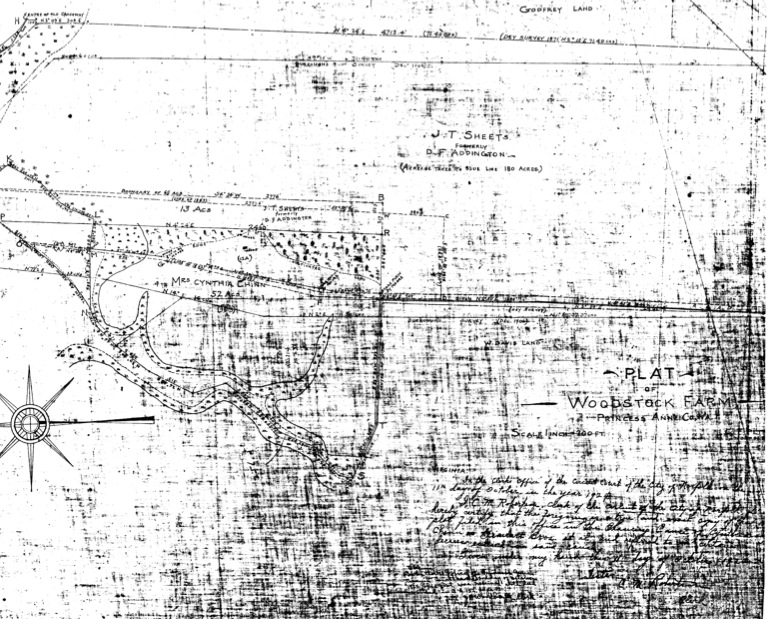 In 1940, Jesse Parkerson purchased the 150 acres of timberland to the east and south of Woodstock Farm, and subdivided it into multiple 4 and 8 acre lots along Woodstock and Providence Roads. 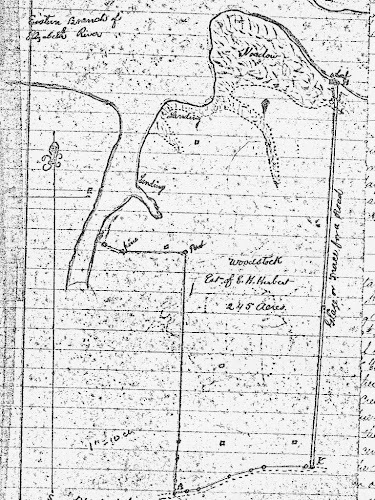 Possibly anticipating the increased traffic, and possibly bending to the petitions of Annie Harrison, Princess Anne County purchased the road from each of the property owners along the right of way (Princess Anne County Deed Book 202, page 505) and then a short time later designated it Route 703, Woodstock Road. Today, a drive along Woodstock Road gives one a vague sense of a rural past -- maybe because the road is a little narrower than it should be; maybe it's the lack of curbs along the eastern edge; maybe it's the utility poles. We do know this for sure: Woodstock developed gradually over more than a century, from Pheby Richards secluded 19th century farm house to the nearly 250 homes that exist today. As you take your next drive down Woodstock Road, remember that you're driving along the same ground Pheby Richards horse-drawn carriage did more than 130 years ago. Just found this while Googling -- it's the text of the sale advertisement for Edward Herbert's land from 1872. Woodstock is item #3 in the list. If I can find an actual image of the newspaper listing I'll be sure and post that too. This sale listing gives us some key details for establishing Woodstock's residential timeline. While houses and other structures are listed for Level Green and Whitehurst farm, there is no mention of a residence or current occupant for Woodstock. Instead, Woodstock is advertised as "well timbered" forest land with good farming potential. Woodstock remained on the auction block for nearly 5 years. In March, 1877 Samuel Kimberly purchased the land for $2,000. Kimberly was a businessman, active in Norfolk society and politics: he was no farmer. In the following year he sold the waterfront property to Pheby Richards, and Elizabeth Addington secured the remaining 180 acres 5 months later. The rapid subdivision and resale by Kimberly bears the hallmark of a simple business transaction, so it is not likely that Samuel Kimberly took up residence here. the Davis farm was to the south, on the land that is now Woodstock Park, Providence Park and the Park-And-Ride. The Herbert's Sunnyside farm was to the west; now the Riverton neighborhood. My wife is quick to point out that Pheby Richards should be considered the first white resident of Anglo-European descent, since it is possible that native Americans lived here in pre-colonial times. While this is possible, I would counter that forest land would not be suitable for farming or livestock and would therefore not make for a hospitable dwelling of any permanence. I moved my family to Woodstock in April of 2011 -- into a house with a story to tell, in a neighborhood with many stories to tell. I've been trying to document those stories ever since.